I know this is straight after my previous post but I wanted to keep the two separate! I wanted to show you an obsession of mine, which is nail polish, in any colour! These are all from George at Asda and as you can see I’m building up quite a collection. Some of the colours I’m on my second or third bottle of, which just goes to show how much I love these! I spotted them a while back early on this year, when the price tage caught my eye. £1.00! Some of the more recent colours are £1.50, but I don;t care, as they are still such a bargain! I use them all the time, and for £1.50, the quality is actually quite good. 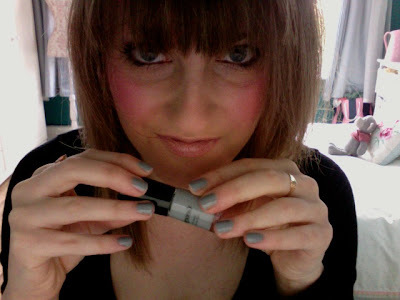 It does chip after a couple of days, but being quick dry, its really simple to reapply. From left to right, the colours are: No.36 Smog, No.35 Frost Bite, No.40 Confusion, No.17 Sunset Orange, No.37 Rain Cloud ( featured in the first image! ), No.33 Sherbet Fizz, No.24 Mulled wine, N.9 Cloudless Sky. I hope you’re all having a lovely weekend. Mine isn’t too great. I don’t feel well, I have to go to work, and I’ve loads of uni work to catch up on. But when I get home tonight, I will have a lovely hotpot waiting for me (yummy), X Factor results to watch, and Dan is coming back for a few days. That should lift my mood! I’ll be posting my Christmas list over the next few days so keep your eyes peeled! I'm exactly the same with nail varnishes, I have so so many, especially the Barry M ones which I have about 15 of!